What is Wisdom and How Can I Find It? Has Archaeology Proven the Gospel of John? Since Christianity's inception, it has been common for Christian faith-defenders to offer evidence supporting their belief in the risen Jesus. From Paul's testimony in 1 Corinthians 15, the claim of eyewitnesses to support the resurrection of Christ has been integral to Christianity. Many people point to the fact that Jesus's apostles died without ever recanting their belief in him as evidence of the truthfulness of their testimony. But is this as strong a piece of evidence as we've been led to believe? How do we know the apostles were actually martyred, and does dying for one's faith prove anything other than loyalty to a belief system? These are the questions Dr. Sean McDowell takes up in his new book The Fate of the Apostles: Examining the Martyrdom Accounts of the Closest Followers of Jesus (Ashgate, 2015). In The Fate of the Apostles, McDowell traces the historical evidence for the deaths of each of the Twelve and offers an objective rubric for weighing the probability of their martyrdoms. Martyrdom is a heady concept. Across the theological spectrum, there are many people who give up their comfort for their beliefs. There are fewer who may subject themselves to pain or abuse because of their faith, and fewer still who die for a religious belief. But all religious traditions can probably point to someone who qualifies as a martyr for their particular faith. So, how to approach the apostles' martyrdom, if they truly were martyred, encompasses the first four chapters of the book. McDowell keenly clarifies his goal is not to show the apostles were steadfast unto death not simply in their refusal to give up Christianity, but they very specifically refused to deny seeing the risen Christ. In the book, McDowell spends the first four chapters outlining the nature and understanding of what martyrdom is, how it would have been understood to the first generation of Christians, and how it would fit within their newly forming belief system. He then devotes a chapter to each of the apostles, including Paul and Jesus's brother James. As would be expected, the historical evidence shrinks when lesser-known apostles such as Simon the Zealot or Matthias are considered. Still, McDowell does a great job showing that even with some apostles' fate in question, there is ample evidence of apostles who did in fact die for their testimony of the risen Jesus and there exists not a shred of evidence that any apostle recanted their belief. Given each would have been considered an eyewitness testifying on first-hand knowledge, this is impressive and does the heavy lifting in setting up the historical bedrock that the disciples did have some kind of experience that needs explaining. While the book is written and priced for an academic audience (Amazon is offering the hardback at a pricey $118), McDowell's style is open and easily enough read to be handled by a sophisticated high school student. The footnotes throughout offer good support for his claims within the text and his openings and conclusions of each chapter gives the reader a nice, concise guide to the evidence more fully developed between them. The Fate of the Apostles takes on a historical question that no one else to my knowledge has done in such a complete manner. McDowell has truly done us a favor in his research and publishing, investigating claims that were assumed but not demonstrated in a systematic way. We now have a go-to source that should advance the discussion for the evidence of the resurrection. For anyone interested in church history, apologetics, or the origin of Christianity, I highly recommend this book. 1. McDowell, Sean. 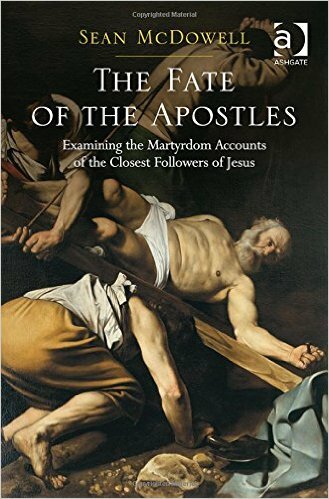 The Fate of the Apostles: Examining the Martyrdom Accounts of the Closest Followers of Jesus. Burlington, VT: Ashgate, 2015. Print. 4. There is "The search for the twelve apostles" by W S McBirnie. Both look very interesting.